ATLANTA (AP) — Trae Young just might make the Atlanta Hawks fun to watch this season. The rookie point guard flashed some dazzling ball-handling skills in his preseason debut, keeping his teammates and fans involved in the action while he is on the floor. Atlanta is not expected to win many games this season, but Young will likely win over his teammates and more than a few fans. In his preseason debut Monday night, Young provided a glimpse of what Hawks fans can expect this year. On one play he bounced a pass off the backboard and later wrapped on around a defender on the baseline to assist on uncontested dunks. Some not so good: It was far from a perfect night as Young missed 10 of his first 11 attempts from the field. But he seemed to get a pass on his shooting — for now. The seamless way he involved power forward John Collins, shooting guard Kent Bazemore and small forward Taurean Prince caused a loud stir from the small crowd at Georgia Tech. At least for one preseason game, he validated why the Hawks traded down two spots on draft night to acquire the freshman out of Oklahoma with the No. 5 overall pick. The 20-year-old had six assists before he committed a turnover, the best moment coming in the second quarter when he ran a pick-and-roll with Collins at the top of the key. Young drove around Julius Randle and drew Davis his way before bouncing an alley-oop pass off the backboard that Collins grabbed for a hard dunk. With the Hawks playing another four exhibitions before opening the season Oct. 17 in New York, Pierce will continue to install his offense, a scheme that’s predicated on pushing the ball quickly up the floor before the defense gets set. Young brushed off his difficulty shooting. He had a similarly rough start in the NBA summer league before settling down. As long as he’s handing out assists, Young believes his shots will start to fall. 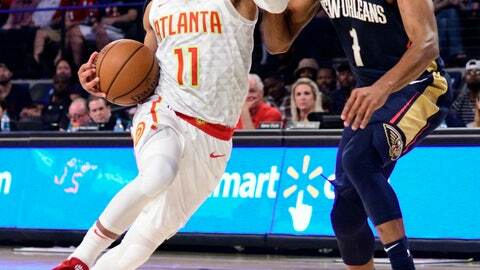 He finally got going against New Orleans’ reserves in the third quarter, hitting consecutive shots off Alex Len’s block and Collins’ steal to give Atlanta the lead for good. He finished with eight assists and two turnovers and scored 11 points on 5 for 16 shooting. Vince Carter, a 20th-year veteran and eight-time All-Star, continues to offer encouragement.